For centuries, the wooden architecture of Varzuga has corresponded to the needs of the residents, who make their living from the riches of the White Sea. The historic Russian north-- particularly the area around the White Sea—was for centuries dotted with large villages sustained by the northern forests and by the bounty of the sea. One of the most important of these villages is the ancient settlement of Varzuga, located in the southeastern part of the Kola Peninsula in the Murmansk Region. Varzuga has one of the most impressive surviving architectural landmarks in the north: the Church of the Dormition of the Virgin, built of logs in 1674 with a soaring "tent" tower. Varzuga is situated along high banks on both sides of the Varzuga River some 20 kilometers (12 miles) north of the point where the river empties into the White Sea. Behind the village on both sides of the river are high dunes covered with juniper bushes. Farther inland are small coniferous forests. The landscape is especially beautiful in the summer, when the almost constant light compensates for the region’s long, dark winters. Some official sources state that the current population of Varzuga is approximately 900, but this figure includes other villages in the area. The 2002 census gives Varzuga itself 351 residents; in contrast, the population in 1910 was approximately 1,000. Varzuga is first mentioned in written sources in 1466, when the area was still nominally under the control of the medieval trading city of Novgorod. By the end of the 15th century, the area had entered the domains of Muscovy. Varzuga’s prosperity in the middle of the 16th century came to an end when the village was raided in 1568 as part of a campaign by Ivan the Terrible to extort further revenues for his military campaigns. From the 16th to the latter part of the 18th century, Varzuga was economically linked to various monastic institutions, in particular the great Transfiguration Monastery on the Solovetsky archipelago in the southwestern part of the White Sea. 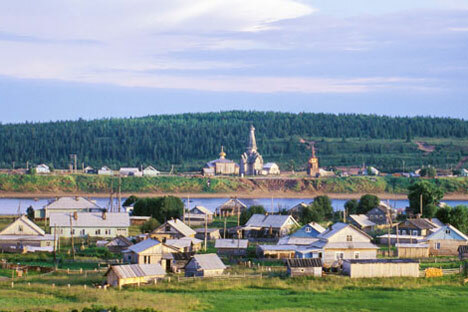 At first glance Varzuga appears isolated—it is connected to the regional center of Umba by a dirt road—but from Umba, there is a paved road to the large rail station at Kandalaksha. And the village has recently been connected to the regional power grid, which ensures a dependable power supply. As for centuries past, the basic asset of Varzuga is its fishery, which continues to exist under skilful local management in the post-Soviet era. This enterprise provides jobs and a measure of economic stability for those who have lived in the area for generations. In recent years, Varzuga has gained another viable source of income based on its reputation as a prime location for salmon fishing. Sportsmen from Russia and abroad can buy deluxe fishing packages that include ready access to the town (helicopter flights are an option) and well-stocked cabins farther up the Varzuga River. Sports tourism has become a boon to many residents of Varzuga and is closely related to the fishery. The emphasis on fishing also effects the design of the village’s traditional log houses, which are smaller than those of agricultural villages such as Kimzha. Ironically, with their relatively favorable economic position, residents in the village seem less willing to maintain log houses from several decades ago. New houses–some of log construction and some of masonry–are more and more replacing traditional dwellings. But for all of its resources, what makes Varzuga distinctive is the wooden Church of the Dormition of the Virgin, which rises 34 meters (111 feet) above the high right bank of the Varzuga River. Remarkable for its construction logic as well as its beauty, the basic log structure from 1674 has withstood the elements in its exposed location. A number of modifications were made in the 19th century, and both exterior and interior were clad in plank siding. A restoration completed in 1973 returned the upper part of the church to its original appearance. On the interior, the icon screen was dismantled for restoration, and work slowly continues on the main surviving icons, which date from the 17th and 18th centuries. The main place of worship for Varzuga is the adjacent 19th century Church of Saint Afanasii. It is called a "winter church," because its lower form allowed it to be heated for year-round use. There are also two smaller churches on the left bank--the Church of Saint Nicholas (probably the first church to be founded in the area) and the Church of Apostles Peter and Paul. But even within this bucolic setting, there can be sharp controversies, such as the one that arose in regard to the recent rebuilding of the bell tower near the Dormition Church. The original tower adhered to the octagonal form traditional in the north. The new tower is in a very different, squat shape that has outraged many preservationists. The church's position is that the ungainly structure is needed to support a heavier weight of bells. Varzuga is a living environment that exists in a rapidly changing world with modern expectations. It is not a museum display. At the same time there are legitimate concerns about preserving the traditional wooden architecture that is such an important part of the cultural legacy of the Russian north. Like many other traditional Russian towns, Varzuga continues to search for the proper balance between heritage and development.